Click here to read about DVT Awareness Month. To reduce the immediate and long-term dangers of deep-vein thrombosis (DVT) and pulmonary embolism (PE), which together comprise one of the nation's leading causes of death. The Coalition will educate the public, healthcare professionals and policy-makers about risk factors, symptoms and signs associated with DVT, as well as identify evidence-based measures to prevent morbidity and mortality from DVT and PE. 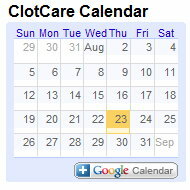 Since ClotCare's mission is to help others improve lives by providing both patients and healthcare providers with the most up-to-date information and expert insight on optimal use of antithrombotic and anticoagulant therapy, the goals of the Coalition to Prevent DVT are consistent with those of ClotCare. Together with the other members of the Coalition, we hope to make a difference by providing information that can help to eliminate hundreds of thousands of needless complications and deaths that occur each year. The Coalition, which is comprised of national thought leaders and representatives from more than 40 member organizations, was established in early 2003 as a result of the Public Health Leadership Conference on Deep-Vein Thrombosis. The conference, which was held in February 2003 in Washington, D.C, provided a forum for discussing the urgent need to make DVT a major health priority in the U.S. The meeting was co-hosted by the American Public Health Association (APHA) and the Centers for Disease Control and Prevention (CDC). Why is there an urgent need to make DVT a major health priority? The following facts and statistics are taken from the website of the Coalition to Prevent Deep-Vein Thrombosis. More people suffer from DVT annually than heart attack and stroke. Up to 600,000 patients are hospitalized each year for DVT. Pulmonary embolism causes more deaths annually in the United States than breast cancer, AIDS and highway fatalities (combined). Fatal PE may be the most common preventable cause of hospital death in the United States. Only one-third of hospitalized patients with risk factors for blood clots received preventive treatment, according to a U.S. multicenter study. PE is the leading cause of maternal death associated with childbirth. A woman's risk of developing Venous Thromboembolism (VTE) is six times greater when she is pregnant. To learn more about the Coalition to Prevent Deep-Vein Thrombosis, please visit the organization's website at www.preventdvt.org.